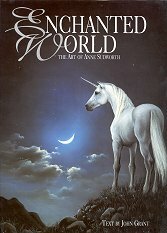 At over 1000 pages, this must be the definitive essential work on Fantasy. 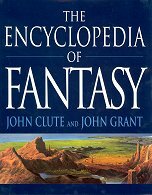 Heavily cross-referenced, it covers authors and their works, films, TV series, and fantasy tropes, from the well-known to the obscure. The headings range from TOLKIEN to THINNING, from FAERIE to FRANCE, from WEREWOLVES to WAINSCOTS. The cross-referencing means it takes hours to look up anything -- every entry points to others, leading you on and on through the BOOK in your own never-ending QUEST for SEHNSUCHT and... (sorry -- it's catching). GoH speech at Reconvene, the 1999 Eastercon. Anne Sudworth is a fantasy artist famous for her "Earth Light" pictures of strangely glowing trees, amongst others. Here is a collection of some of her best, along with text by John Grant. The pictures are excellent, both in the large original (I have seen some of them exhibited at SF conventions), and in their glossy reproduction here. It is difficult to believe that these are all pastels: the colours are sharp and definite, and her trademark lighting effects positively glow. They are all evocative: I can almost feel the stories weaving in my mind as I look at them. Grant's text adds some background and interpretation to the pictures. I was amused to find how often I disagreed with his description of the emotions evoked by certain pictures -- some of the blue/white light he finds cold, forbidding and alien, I find cool, soothing and welcoming -- some of the ruddy lighting he finds autumnal and comforting, I find fiery and menacing. But it's no bad thing for the same picture to evoke different responses in different viewers. I am certainly with him in wanting to step through The Arch into the land beyond, however. A marvellous collection of pictures.